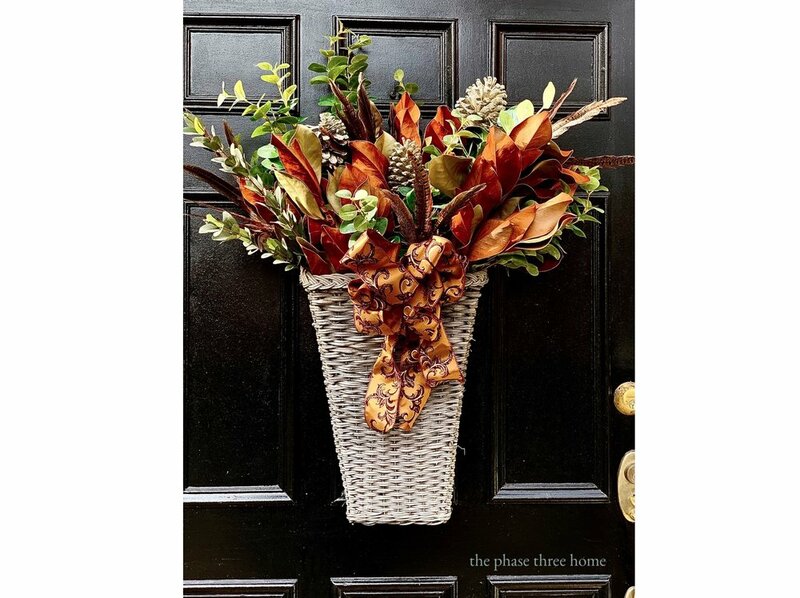 For those of us who sometimes run late with their Christmas decorating (read…usually), there’s nothing like a bit of front door holiday decor to add a quick last minute pop of the season ——in no time at all! It’s easy, fun to do and only takes minutes to pull together. And is a beautiful way to welcome guests and family to your home. Here’s how three simple steps can add an up-styled, festive vibe to your entrance! This year I over-filled this beauty with tons of seasonal hues and textures: Magnolia, greens, pheasant feathers and pine cones. I personally love the spill factor. If I run out of material, I’ll grab a sprig or two from my garden or shrubs for filler. There’s always room for more. And keep in mind, saving your Magnolia leaves, faux greens like this eucalyptus—along with accents and pops of color— each year, make this project a breeze when it comes time for next year’s basket assembly. Think ahead! The right bow always seals the deal. So make it something special. As I’ve mentioned in previous posts, I’m a big fan of Costco’s Kirkland brand ribbon. It’s a quality fabric that comes in a variety of beautiful patterns and colors, it’s wired so it keeps its shape and withstands all sorts of weather….and best of all, it sells for a price point that‘s hard to resist. I keep it in stock all year long. What ever you choose to complete your look, a last minute tacking with light weight floral wire is a great way to top things off and keep everything in its place. And now you’re good to go!